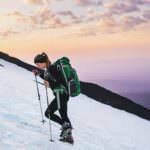 Plan Your TripAsk OregonSnow SportsWhere I can snowshoe with my pooch? I’m glad you brought this question up, because I was a little hesitant to bring my dog along with me to Bend last weekend. Fortunately, U.S. Forest Service regulations allow dogs, leashed or unleashed, on the south side of Century Drive, en route to Mt. Bachelor. I’d highly recommend Wanoga and Edison Sno-Parks. There’s also a dog park on the far right side of the parking lot at Mt. Bachelor. I’m not sure if this is affiliated with either of the sno-parks, but there are plenty of dogs playing and running around in this area, so if you’re up for skiing at Bachelor, a lunch break at the dog park isn’t so bad. Wanoga Sno-Park is great, too. And it’s probably the only groomed, dog-friendly sno-park in Oregon. Edison Sno-Park sits in the shadow of Mt. Bachelor. The mountain acts as a pretty great wind block but the trails aren’t groomed. When the snow is good, I’d recommend this area, but when it’s icy it can get a little treacherous. I came across this site for you to look at, too. In case you have any more questions, feel free to email me back and I can help you find some more dog-friendly activities.